Humankind’s speculation about the existence of other worlds like our own turned into a veritable quest with the launch of NASA’s Kepler spacecraft in March 2009. The mission is designed to survey a slice of the Milky Way to identify planets orbiting other stars by looking for the telltale dimming of light that occurs when an orbiting planet passes in front of the star. Kepler has discovered over 2,300 viable planet candidates ranging from one-half the size of Earth to twice the size of Jupiter. From scorched, rocky planets to temperate giants, we’ll hear about Kepler’s milestone discoveries and the techniques scientists are using to make them. Kepler is honing in on the answer to the question that drives the mission: Are potentially habitable worlds abundant in our galaxy? 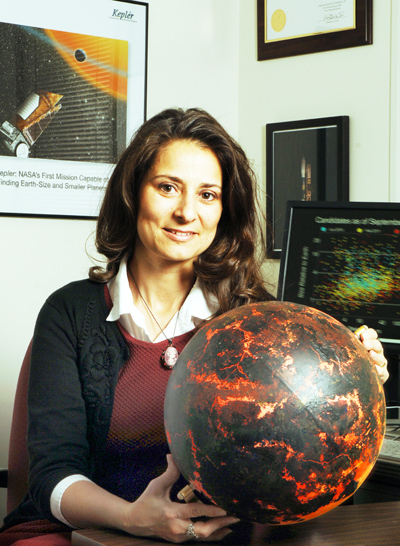 Dr. Natalie Batalha is a professor of physics and astronomy at San José State University in the heart of Silicon Valley, California and the Science Team Lead of NASA’s Kepler Mission. She holds a bachelor’s in physics from the University of California (UC), Berkeley, and a doctorate in astrophysics from UC Santa Cruz. Dr. Batalha started her career as a stellar spectroscopist studying young, sun-like stars. After a post-doctoral fellowship in Rio de Janeiro, Brazil, Dr. Batalha returned to California. Inspired by the growing number of exoplanet discoveries, she joined the team led by William Borucki at NASA’s Ames Research Center working on transit photometry—an emerging technology for finding exoplanets. Eleven years later, she stands poised with the Kepler team to make discoveries that humans, up to now, have left to the imagination and the realms of science fiction.